In "Ripple," the latest Nike Golf ad, we witness the journey of a way-back-when Rory McIlroy, following the career of his idol, Tiger Woods. 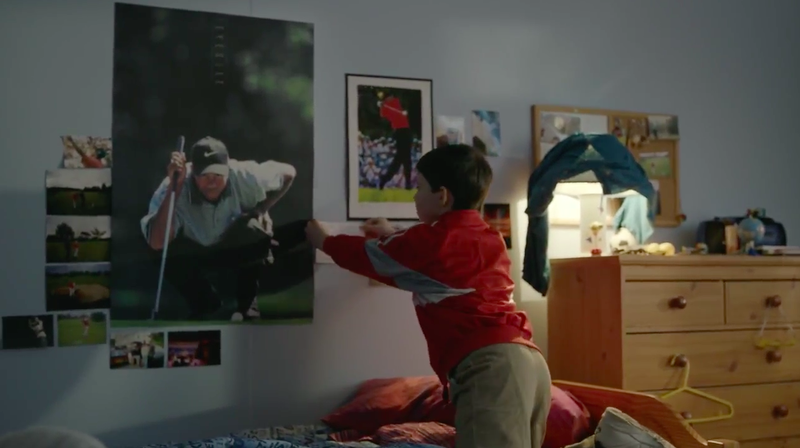 The young boy watches Woods play, puts his posters up in his room, and experiences his own victories and losses as he plays the game himself. The film culminates with a scene of current-day superstar McIlroy teeing off after Woods at the start of a round. Created by Wieden + Kennedy, the spot is lovely and inspirational. It's also not the first time McIlroy and Woods have appeared in a Nike Golf ad together. This follows the funny and very popular "No Cup Is Safe" spot from 2013, although with a completely different tone. After signing McIlroy, 25, to a five-year contract in 2013, it's clear Nike wants to position him as the heir to Woods, 39. And McIlroy is showing signs of living up to that hype—he's won four majors now, though of course it's a long way from Woods' 14. "It's been an incredible journey for me, going from massive fan to competitor," McIlroy said in a statement. "To think that not too long ago I was that little boy watching him on TV to where I am now. It's been a cool journey and I'm very lucky I get to compete with and against him, because he inspired me as a kid and he inspires me now. He's the best player I've ever seen."